Amanda Devereux, a successful doula in New Orleans and co-creator of the Birth Boot Camp DOULA program. There is something that happens in the natural birth community that we don't talk about often. It happens among birth workers and it is called burnout. Burnout happens for two main reasons, both tragic to witness, especially among those once so dedicated to a profession and a work. The first is financial. It is a fact of life that living takes money. We all have bills to pay, families to feed, and a finite amount of time in which to do it all. It can be hard to make a living teaching birth classes or working as doula or midwife. Few teach a small business class for birth workers so they know how to make it, how to charge for something they might want to give away, and how to turn passion into a sustainable business. Any small business owner can tell you that running a successful and sustainable business is hard in a plethora of ways. The second reason for burnout among birth workers is simply how difficult it can be to watch birth in the modern obstetric climate. Birth isn't always easy, the hours are sporadic if you attend births, you deal with many people and different types of families and relationships all at an exciting, but often stressful part of life. How do you handle this without guidance, the ability to decompress, or just somebody to talk to who understands? I have sat in a room with birth workers more than once and heard a doula say that she can just no longer handle attending births- they are too disturbing for her and she can't keep bringing that home to her family anymore. She also just needs to make a living. Maria Pokluda, an experienced DFW doula and co-creator of the Birth Boot Camp DOULA program. The world NEEDS doulas and childbirth educators who are skilled, compassionate, who can pay their bills and who are finding joy and fulfillment in their profession. It is possible to do this. I love the words of a doula friend of mine and childbirth educator, Tashina Benning-Witter. She openly talks about making a change in the way she practiced as a doula when she committed to herself that she would require a full length birth class of some type for any of her moms. She also decided to openly tell them that she was a doula for natural births. She found that when she said this, women embraced it. They were WAITING for someone, just one someone, to believe that they could do it. Suddenly she found herself happier as a doula and (pay attention, this is the important part) her clients were happier too. 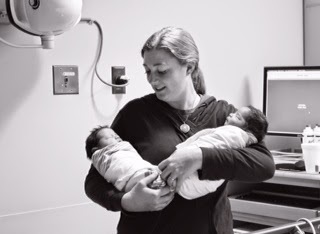 They were having better birth, breastfeeding, and even parenting experiences because of the high level of service she was able to provide for them. I hope you aren't tired of me talking about Birth Boot Camp. It is my job, my passion, my way to make birth better from the ground up. I love what we are doing in childbirth education. Childbirth education matters. But it isn't enough. We have always included doulas as an important part of the birth team and a person that we encourage every couple to have on their side. Now we are doing more than encouraging doulas, we are now training them. Yes, we have just expanded into the doula territory. Maria Pokluda and Amanda Devereaux have created together a doula program beyond any other out there. What does it have? -Our doulas will be mentored by other experienced doulas who can answer their questions and help them through tough times. -They include a comprehensive marketing training so that the doulas can actually run a business successfully. Plus, they can go back and access this marketing information later when they need it. This marketing info is taught by a marketing specialist (Shannon Blackwell, who has years of experience in small business marketing and who has helped launch Birth Boot Camp as a company.) Our marketing training is uniform for all doulas going through who train with us. -Childbirth education classes to attend are included in your doula training so you don't have to go finding them on your own. -All your materials for yourself and your clients are professionally printed, beautiful, and ready to go so you don't have to make photocopies or scrounge up your own paperwork. The requirements and the work involved in becoming a Birth Boot Camp DOULA are significant, but the benefits are incomprehensible. This program is amazing. I truly believe that the more women we have out there with the knowledge and the skills to help women have empowering, positive birth experiences, the more change we can make. The cesarean section rate can be lowered. America can have healthier babies and women. We can help make that happen. I truly believe that this starts with us. This however, is a big job and we need TOOLS to make it happen. We need experienced birth workers to blaze a trail and teach us how to make this happen. Women are ready for change. Women want and deserve to have great births. We can be part of making birth better, healthier, and more beautiful. Birth Boot Camp DOULA is one way we can make this happen. If you ever come closer to Ohio, I'm there! Thanks for mentioning the distance to travel for training. You are right- we only do trainings in Dallas/Fort Worth! This is actually a wonderful thing! We have a "team" that does trainings. It is always the same group of people so that each and every training is consistent and every trainee gets the same training, across the board. This is one of the things that we believe will make us unique and, frankly, superior.